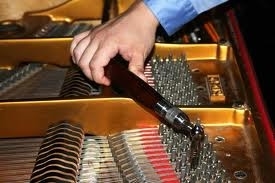 Tuning your piano is the most basic of services. Yet, it is the most important. If a piano is not kept in tune, it is not inviting to the musician, novice or professional. Equally, if the tension on the strings is not kept proper, one or more pitch raises may be necessary to correct it or damage to the instrument could result. "No matter what any salesman may say, no matter how finely a piano may be made, no matter, in fact, what the physical circumstances or the price, or the domestic conditions may be, there is no such thing as a piano standing in tune, month after month. The better the piano, the more frequent and careful tuning it should have." "from the layman's standpoint, four tunings a year should be sufficient. The tuner knows, however, that if he had time to tune his piano as often as his ears tell him, he would tune it once a month at least. From a strictly scientific point of view, it is probably true to say that no piano ever made has ever stood in tune, unless it were maintained at a constant temperature and under constant barometric and hydroscopic conditions in a laboratory. When you consider that there are 227 strings and each is pulling on its pin, held in place by friction of wood on metal, and the pull is somewhere between 160 and 200 pounds, totaling between 33000 and 45000 pounds, and being under the added strain by the hammers hitting them, you will realise that it is impossible for the pins to hold their strings exactly as the tuner left them." The quality of tone for a string is better when the pull on the string comes close to the maximum safety load (about 180 lbs). Therefore, the tension across a piano from its strings (about 227) is about 20 tons. Add to this changes in temperature and humidity, and it becomes clear that a piano cannot stay in tune by itself. Further, if left standing too long unserviced, not only will the pitch of the instrument become extremely flat, but ultimately damage to the soundboard and bridging will occur due to the relaxing tension of the strings.